FINALLY! 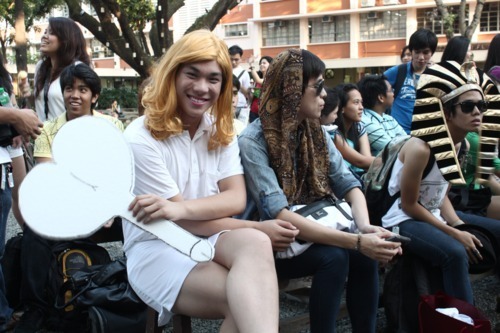 I was able to pay tribute na to ATENEO Dollhouse! In fair, kabowgera nga sila… and I have photos to prove it! Here’s Nyko, best in sundo. Ganyan talaga pag nakashiny. choz! Tone down na yan, dapat maglolong gown ako. Coronation daw eh! haha! Ano naman masasabi nyo sa red shoes? Ang mga hurado. choz! I love na may paypay talaga. Very MADAM! Blockbuster hit kayo teh! Kayo na! Ok, tinalo talaga ako sa pagkablonde! The freshy dollhousers! With Nikki! Si Lady Gaguard nyo! San tribo galing teh? CHOZ! Best in tribal ka! Vice Ganda na walang kahulaz hulaz ang lipstook! The 2 nominees for Queen Mother. Pareho naman kayong WIN! The past Queen Mothers. Very corporate na sila…yes, corporate sa kanila yan! haha! With my co-belieber SAAB! Madaming nagubus ng stage makeup. hahaha! Ganyan ka formal ang coronation. hahahhaa! I think some articles are best shown in video form. Hindi ko kaya ikwento ang mga speech nilang bongga! Thank you V for editing and being supportive. Kahit d mo music yang scoring, kinareer mo parin. I LUV YEW! Best in Suki sa Youngstar! Thank you for allowing me to write. Actually guys, I usually write pretty long. Kaya ang hirap when they said 200-300 words. My orginal was 1000 words! Best eyyfort na talaga yung 400plus na final ko. OO NA! KAHIT SA PAGSULAT MADALDAL AKO! I don’t know how it started but it seems like the name DIVINE is now synonymous to the title BECKY QUEEN. More than anything, I am deeply honored. I beam with pride and happiness when people call me this. Not too long after I was tagged as such, my “official” engagements followed right away. 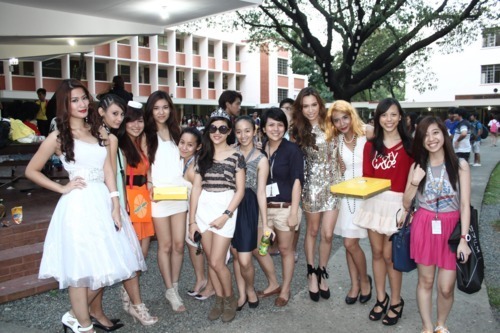 And one of those would be to crown the new QUEEN MOTHER of Ateneo de Manila University’s Dollhouse organization. I’ve been planning to pay respect to the Dollhouse and what’s a better day than the coronation itself? 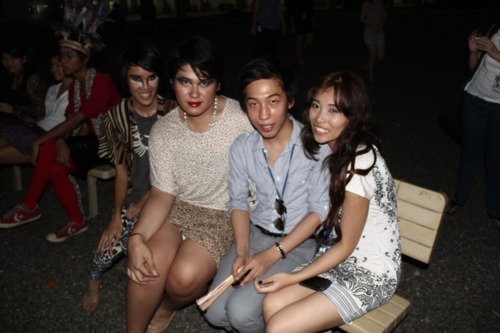 The coronation was a day of high heels, hair spray, wild make-up, hilarious speeches, “balaj” moments and laughter. Each nominee came in their “fiercest” attire and had a platform, which they communicated in 2 minute speeches that could rival a comedy bar act. 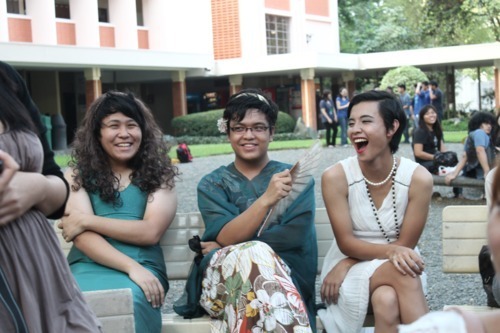 Projects with names “Operation C.H.A.R.O.T.”, which stood for “Changing Homophobe Ateneans for Respect to Outlast… TEEHEE!” But all these colorful monologues and outfits can never mask its true meaning. The fight for EQUALITY is loud and clear. It may be humorous to the other students, but the message is real. Battle Cry Equality is on full speed. As an honorary becky, I am proud to say that we always think out of the box. We don’t take ourselves too seriously and have mastered the art of witty comments to bring the message across and will even poke fun of ourselves just to enforce this. The election may seem like the college version of a stand up comedy act but honestly it’s a movement that pushes our cause forward. This is our version of a rally, this is our platform to communicate, and this is our way of letting you know our plea. We refuse to sit in a corner and wait for Superman. Truth is, we don’t need him, that we have our own band of superheroes, and this is the DOLLHOUSE…. CHOZ! I am happy to see our friends from all levels and different industries colorfully fighting off discrimination. I am happy that even with all the hurt and sadness, we are still the frontrunner of positivity and laughter. As I would always say… You guys make me proud. KAYO NA! So to the DOLLDOM of 2011, make your mark, make the change and of course do it in your most BONGGA way. I will be back soon. I will check up on your “projects” and promises. Can’t wait for your outfits for the SODA (State of the Dollhouse Address). With Much love and admiration, Your Becky Queen Divine.